After having spent over a (completely fruitless) month on fiddling with this without having an actual Force Touch Trackpad to test with, having gotten one recently, it still was insanely difficult for me to finally figure out how to receive Force Touch events from an NSTableView. But I finally did it. Here’s how. In Yoink, the usual way to select all files (pressing ⌘-A like you would in almost any application) is not a viable option. Yoink is written to not have key focus, as it would otherwise interfere with work in other applications too much (believe me, I’ve tried). So I had to come up with a different way to do it. What I’ve done up until now is to allow the user to hold down the option (⌥) key on the keyboard and double-clicking onto any file in Yoink to select all files. When Force Touch was introduced, I thought that would be a very nice alternative to option-double-clicking. And it is. Once I got it working, anyway. What I thought would be the easiest way to get Force Touch events from an NSTableView was to override – (void)pressureChangeWithEvent:(NSEvent *)theEvent. Only that it doesn’t get called as it would normally be called: continuously, after – (void)mouseDown:(NSEvent *)theEvent, with every change of pressure on the trackpad. No, in an NSView-based NSTableView (I haven’t tested cell-based tableViews), -pressureChangeWithEvent: gets called at -mouseDown: with a pressure of 0.0, and then just “dies”, not getting called again until the next -mouseDown:. That’s interesting. And there’s more interesting-ness going on. Once I override the tableView’s -mouseDown:, -pressureChangeWithEvent: suddenly gets called continuously, as you’d expect. So something apparently happens inside the tableView’s -mouseDown: implementation that sort of prevents -pressureChangeWithEvent: from getting called. That alone would have taken more time than the entire feature of having force-click-to-select-all is worth. Next, I thought NSGestureRecognizer could work. I created a subclass of it that overrides -pressureChangeWithEvent: and checked to see if it was called. But it was the same thing all over again. Adding it to the tableView, the NSTableRowView, the NSTableCellView and the underlying contentView of NSWindow, trying to figure out if they maybe swallowed the method call yielded no result or any change. It was all the same. It got called at the first -mouseDown: call, but then stopped. Next I tried a local NSEvent monitor thinking it might do the trick, and it works, but only when the window’s contentView is force clicked, not the tableView. A global monitor doesn’t seem to work with pressure events. So the only way that seemed to get me anywhere at all was to override NSTableView’s -mouseDown:. And that’s what I ended up doing. At first. After a day’s work, though, it still didn’t yield any results what-so-ever. The amount of time I’ve wasted on this is astounding, but apparently, when you keep going and really want to get somewhere, you eventually will. In OS X 10.10 Yosemite, Apple introduced a new NSEvent-tracking API in NSWindow: – (void)trackEventsMatchingMask:(NSEventMask)mask timeout:(NSTimeInterval)timeout mode:(NSString *)mode handler:(void(^)(NSEvent *event, BOOL *stop))trackingHandler that lets you, in a tracking loop, monitor for events matching the mask you provide, in this case, NSEventMaskPressure. I actually had played around with this before, coming recommended from Markus Müller (@fafner on twitter), developer of the marvellous Mac and iOS app MindNode, who, by the way, in order for me to be able to test this stuff before I got my own Force Touch-able Trackpad, kindly invited me to their office to use his MacBook – thank you, Markus. However, I didn’t get very far, as I didn’t know how to use the API correctly. Calling it from – (void)awakeFromNib, for example, isn’t the best idea, as it a) doesn’t appear to be able to track anything and b) locks up the app. It has to be called from inside a tracking loop (like -mouseDown: or -pressureChangeWithEvent:). I decided to imitate NSTableView’s -action and -doubleAction methods for handling receiving force touch events in a target. NSTableView can be set up with a -target that should receive the selectors set in -action, -doubleAction, and with this, -forceTouchAction, as seen in the code above, uses the same approach – send the specified selector to the NSTableView’s -target. 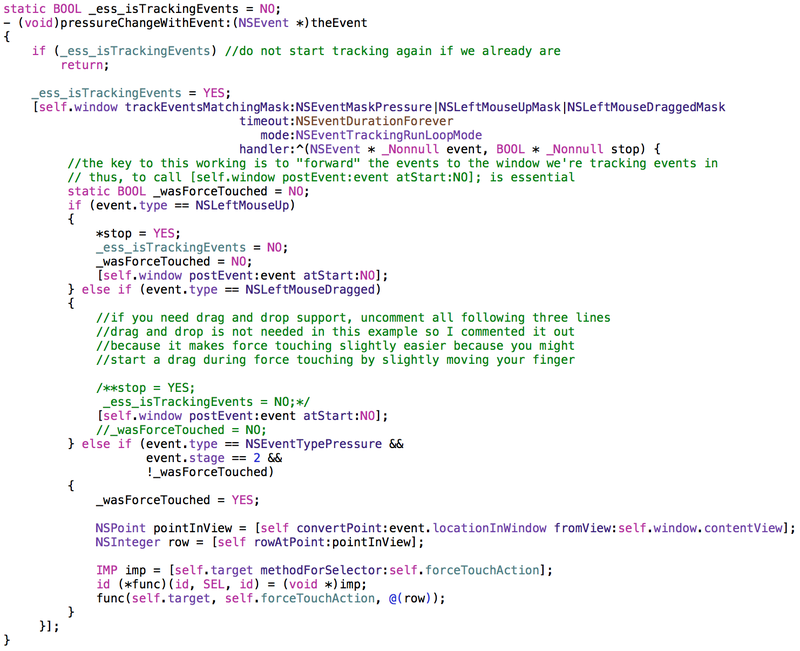 This code starts tracking Pressure-, Drag- and Mouse Up events in -pressureChangeWithEvent:, and practically waits until the Pressure event’s stage 2 is reached, which is a force touch. 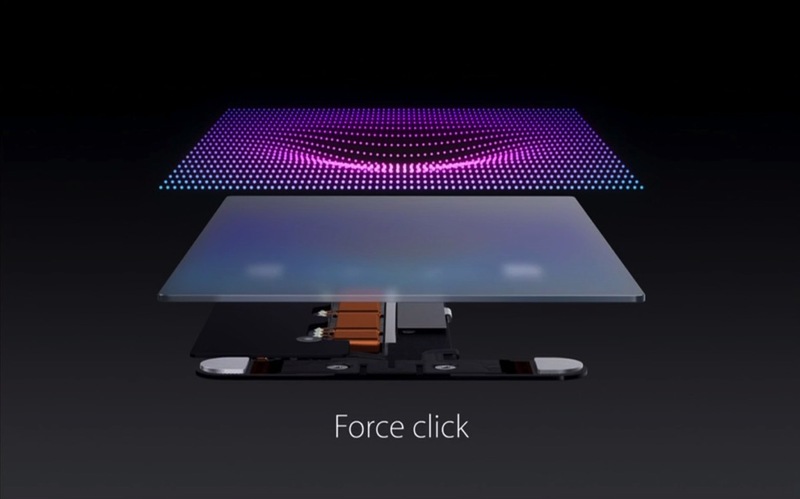 Then it sends the -forceTouchAction to -target. The important lesson that I learned here is that the events have to be forwarded to the window, as they’re intercepted. So calling [self.window postEvent:event atStart:NO]; is imperative. I watch for NSLeftMouseUp and NSLeftMouseDragged because I need to be able to stop tracking at some point, and mouseUp and mouseDragged are the perfect moments to do that. I’ve uploaded a quick sample project to my server which you can download here. It requires OS X 10.10.3 (because of the APIs used). I’ve only tested it On 10.11 El Capitan, though, so your mileage may vary. That implies that it’s somehow possible to pair the Apple TV Remote with a Mac running OS X 10.11 El Capitan – but how? There’s no explanation anywhere to be found. If you’ve already paired your Apple TV Remote with your Apple TV Developer Kit, you won’t be able to pair it with your Mac – you’ll have to un-pair it first. Original Image Credit: Apple Inc., markup mine. A response to this forum threadon the Apple Developer Forums lead me to how to do it: Hold down the Menu and Volume-Up keys on your Apple TV Remote for about 5 seconds, perhaps a little longer, and the Remote’s pairing will be reset. 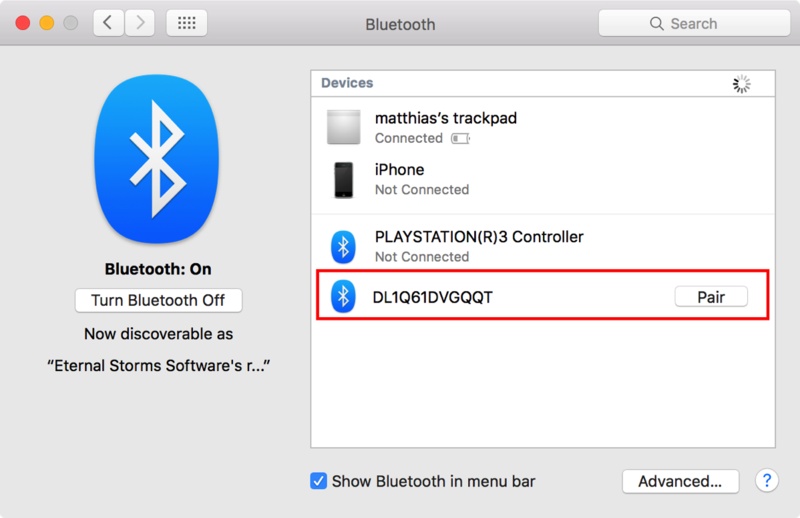 The Apple TV Remote in System Preferences / Bluetooth. Click on Pair to pair the Apple TV Remote with your Mac. There should be a spinning wheel for a couple of seconds after which it should be paired. Update (October 6th, 2015) – Media Control? Oliver Drobnik (@Cocoanetics on twitter) was interested in what kind of Bluetooth profiles the Apple Developer Kit Remote supports – for example, the Media Control profile to be able to adjust volume, play/pause, etc) – or if it can only be used in Xcode’s Simulator. He suggested I use the free Bluetooth Scanner App LightBlue to see what profiles it supports. According to the app and this Apple website that lists the service names, the profiles supported are Battery Service, Bond Management, Device Info and a custom Apple service – so no media control for now. But thanks to Oliver, now we know.